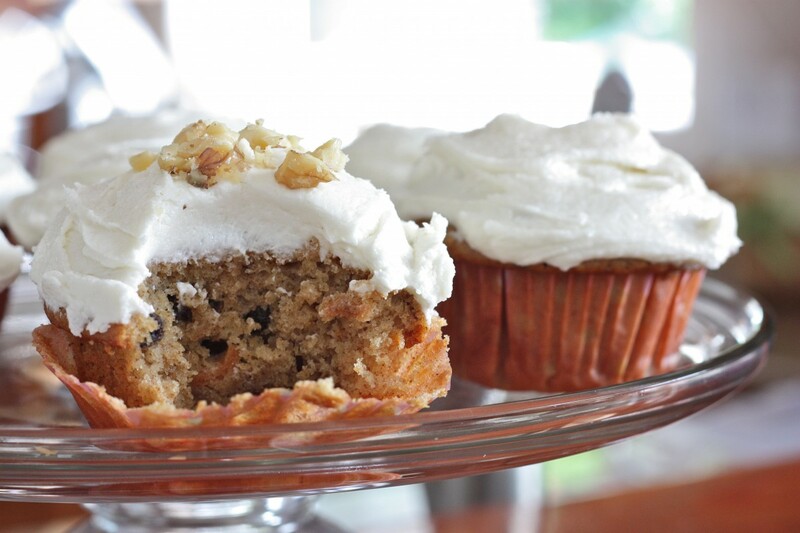 These Amish Friendship Bread cupcakes use chunky applesauce and spicy nutmeg and cloves for a delicious carrot cake variation. Grease one muffin tin. Dust with cinnamon-sugar mixture of ½ teaspoon cinnamon and ½ cup sugar. Pour the batter evenly into muffin wells and sprinkle the remaining cinnamon-sugar mixture on the top. Bake for 40 minutes or until the bread loosens evenly from the sides and a toothpick inserted in the center of the bread comes out clean. This carrot cake Amish Friendship Bread recipe is always a big hit, especially when made into cupcakes and topped with our Cream Cheese Frosting. We used a chunky applesauce that gave the bread an excellent texture and paired wonderfully with plump raisins and carrots. It helps to keep packages of the 4-ounce cups of applesauce on hand, so you can add it to a recipe anytime. Made these the other day and brought some into the office with me… everyone loved them! Those that already had a starter on them asked for the recipe, to which I introduced them to this website! I am so excited to try this recipe! Just 4 more days! Looks fabulous! I am going to have to make some starter and try some of these variation recipes! When I take my starter out from freezer and let it sit, than can I use that one cup and rest of ingredients for this cake. Somewhere I read to first add 1/2c flour etc? Is this right? My recipe from the book for cake was so delicious. I`m trying the carrot next. Another question, do you test all these recipes? I have even started to print favorite recipes and put them in a binder. Rather than cream cheese frosting I dusted this with powdered sugar and like it much better. Much better than loaded with frosting in my opinion. I had only tried the chocolate and cinnamon varieties, it was so nice to switch it up! I would bake a carrot cake for Mother’s Day. this looks yummy. My mom has to be the biggest carrot cake fanatic! She loved this one! My mother is going to love these cupcakes. They look delicious! Has anyone tried these recipes WITHOUT the instant pudding? I don’t think I would like the extra additives and sugar. Hi Anita! You have two alternatives: 1) try a homemade pudding recipe (we have three in our Recipe Box), or 2) skip it altogether. Pudding boots flavor and moisture, but you can exclude it for most recipes. It should be fine to skip for this recipe. Keep us posted with how it turns out — I’m sure lots of people would like to know how it turned out as well.